Barrier Rope - Brandline Branch Out! Barrier Rope. 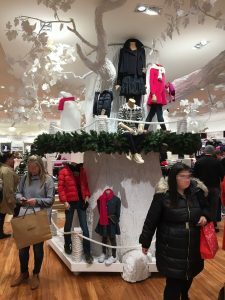 Tong G, a specialist in bespoke retail design and installation reached out to Brandline Products when they needed some way to enclose an amazing tree display they were installing inside a retail store. The display which measures 3 metres in height and 2.7 metres in circumference was installed by the Tong G installation team in one night!. 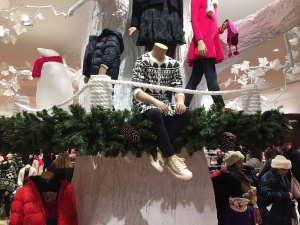 The White Brandline Barrier Rope was used to enclose the display. I think you’d agree it looks fantastic and the stores customers just can’t leaf it alone! The barrier rope that we supplied was a fire retardant, mixed twine, which has been a big seller for Brandline Products in recent times. Being a manufacturer means that we can fabricate the rope to any length you require. We hold coils of 25mm rope in stock at 100 metres lengths. There are many colours held in stock as well as all types of rope ends that we can apply. 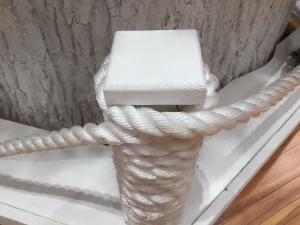 The Barrier rope was wrapped around the posts which enclosed the display. For more information regarding our rope range, call the office on 0870 760 5552. For other products visit our website. This entry was posted in Barrier Rope, Uncategorised and tagged barrier rope. Bookmark the permalink. ← The Best Ways to Print a Cafe Barrier.